The focus for the past week was on game design. I started with a big flowchart of all the different screens, options and possible flows between them. 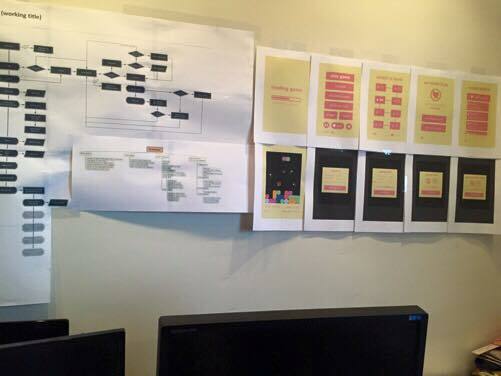 Then worked out a document with the game rules and finally did the initial visual design for all the screens. It was time-consuming, but necessary, and has been fun. There are still some tweaks to be done, but the game is slowly coming alive now that the design is hanging up on the wall here. The project has gotten the code name Venus, just because it needs to have a name. I’m still struggling with a real title for it. Based on the design I came up with a ballpark figure for a release date for Venus; end of Augusts or beginning of September. Implementation of the first screens starts this week! The weekend only allowed me to squeeze in a couple of hours and the first two days of this week are reserved mostly for contracting, so full blown development continues on Wednesday. What programs did you use for the flowcharts and mockups? Flow charts are done in Visio, mind maps in xMind and the mockups in Photoshop. I kind of regret using Photoshop now though, because I just figured out I need to scale up all the sprites so a vector based tool would have been a better choice.